To love yourself has unfortunately become taboo. We look at it as having a big ego and as a thing we should put on the back burner only after everyone else has been taken care of. When we can’t say “I love you” to the one in the mirror, when we constantly criticize our bodies and our talents, and when we do loving things for others and never ourselves, problems set in. We begin to quietly resent the people around us, until we explode. We cause unnecessary stress in our bodies by guilt when we actually do something even small for ourselves, and worry when we actually do something like say no to a friend. This type of energy can be felt everywhere. This energy is draining, heavy, and reeks from us like stagnant water. On the other hand when you love who you are, not your title or wealth or the “names” you hang around, but who you are, your being, you in turn understand the importance of self-nurturing. You take time out, go to a spa, cook what you enjoy, learn to speak up and express your emotions. This is healthy. When you are at your best, feeling great, this is the energy that emanates from you. Your family, friends, co-workers, in fact everyone you come in contact with can feel this energy. 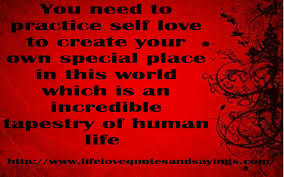 This energy carries love, when you love yourself you can fully love another, this is the gift you can give to the world. This week can be the start of one of the most important things you can do for your life. What does it mean to self-nurture? it means not only to do good things for yourself, but to recognize when to release things that drain your energy. It means you speak up when you need to, express your feelings, and live knowing you are in charge of your life. This week make a list of the the things that no longer serve you and let go of at least one of them. You can also practice “speaking your truth.” Pay attention to what you commit to when you really don’t want to. For example, your work needs volunteers for the fund raiser and all eyes turn toward you, if you say yes out of guilt, then you are not being true to your feelings, speak up, be brave, and honestly say a plain and simple, no. If you really want to go all out, do both of these and throw in a bonus of doing something wonderful for yourself. A terrific post! Thanks for your work and for sharing your insights!